If you’re looking for books to share with kids during Children’s Book Week later this month, I hope you’ll check out these next two stunning picture books for older readers. You might also be interested in my article, Ideas for Children’s Book Week 2017. Mechanica: A Beginner’s Field Guide by Lance Balchin, published by The Five Mile Press (2016.) RRP: $Au 24.95 HB. Kids are going to be so intrigued by this concept! It’s a dystopian world, our world, at the end of the 22nd Century. And it’s a pretty grim scenario: with all animal life wiped out. Mechanica - human-created life forms - have been introduced but some have cross-bred with renegade drones. The book itself is mostly a kind of visual encyclopaedia of these creatures, but also includes a brief history about them, and some humans involved with them: Chen Su, Reginald P. Prescott and Verity Crisp. The history also mentions the Mechanica Chronicles, a record of Crisp’s journey through the Orient and her encounters with Mechanica. I so hope this means a Balchin novel is on the cards for the future, and if I were an astute film company I would be offering options for this fascinating world right now! Mechanica quite understandably was short-listed in the CBCA’s Picture Book of the Year for 2017. Get more of an idea of the book via this video below. 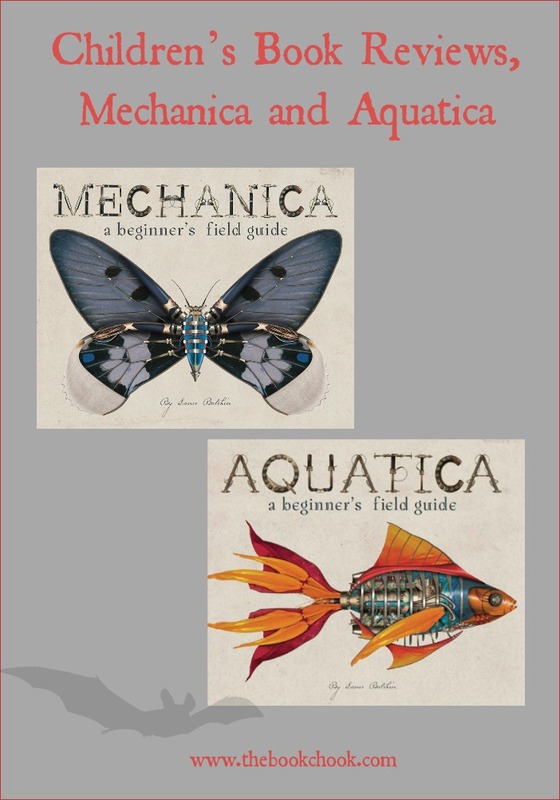 Aquatica: A Beginner’s Field Guide by Lance Balchin, published by The Five Mile Press (2017.) RRP: $Au 24.99 HB. While Mechanica are creatures of the land and skies, Aquatica are their seaborne relatives. They pose a danger to any human brave enough to venture onto the ocean. Again we meet up with Verity Crisp, and realise that unless she can intervene, there is likely to be a war between Earth’s Militia and all Mechanica, a war that will lead to the annihilation of the human race and destroy Earth’s remaining atmosphere. What follows is not a narrative devoted to this tale, but again exactly what the title describes - a field guide where we read about and see various forms of Aquatica. You can guarantee both these books will fly off shelves or be received at home with delight. I love finding picture books I know will appeal to older kids. Sometimes they are held back from grabbing such books because of messages they’ve received about material needing to be purely text for their age. Perhaps you could ask them why then are adults allowed to read magazines and newspapers, obviously a mix of text and images? The incredible detail of the images in both books will appeal to kids and adults alike. Youngsters who love science and machinery will adore not only the steam-punk vibe and photography-like illustrations, but also relish the descriptions of creatures like Alcidae Profunde (Deep Penguin) and Venator Selachii (Hunter Shark). Oh, and I have a challenge for kids that’s surely worth a “well-spotted” reward from parents and teachers: what is the typo on page 2 of Aquatica? I’ll definitely be adding both Mechanica and Aquatica to my Children’s Book Week Australia 2017 Book Suggestions, which you’ll find embedded below.